Its been quite a while since I went to one of the National Portrait Gallery’s Drawn In sessions. A friend suggested we go and so we joined lots of other people for an afternoon session of sketching and listening to some beautiful singing. I managed 3 sketches in various styles and media. 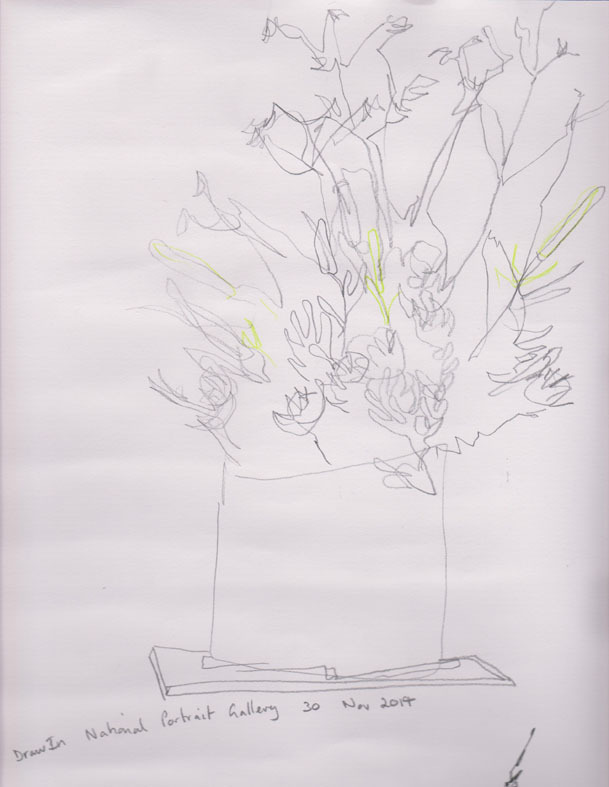 First a blind drawing in pencil of a floral arrangement in the area we were drawing. A view to the display of portraits by Rick Amor in the gallery entrance. Rick Amor, Gallery 1, National Portrait Gallery, Canberra, 30 November 2014, pencil, ink and watercolour. 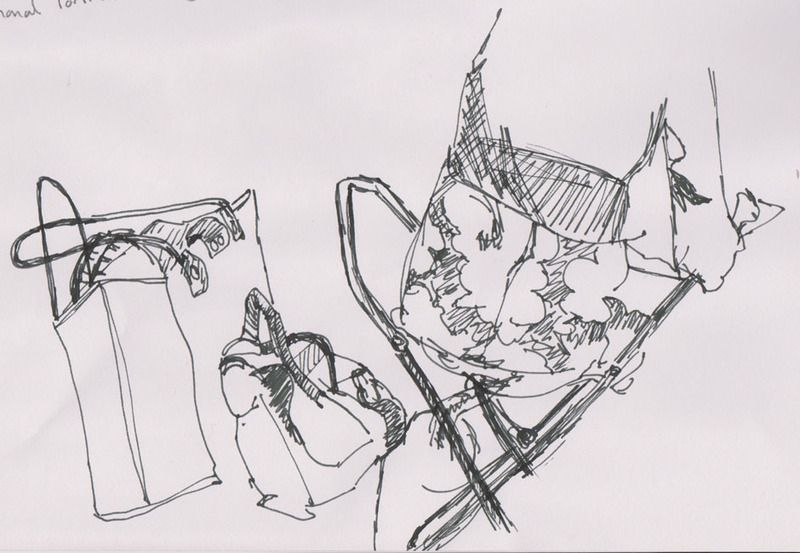 The last was a still life and partial figure of the woman sitting in front of me. 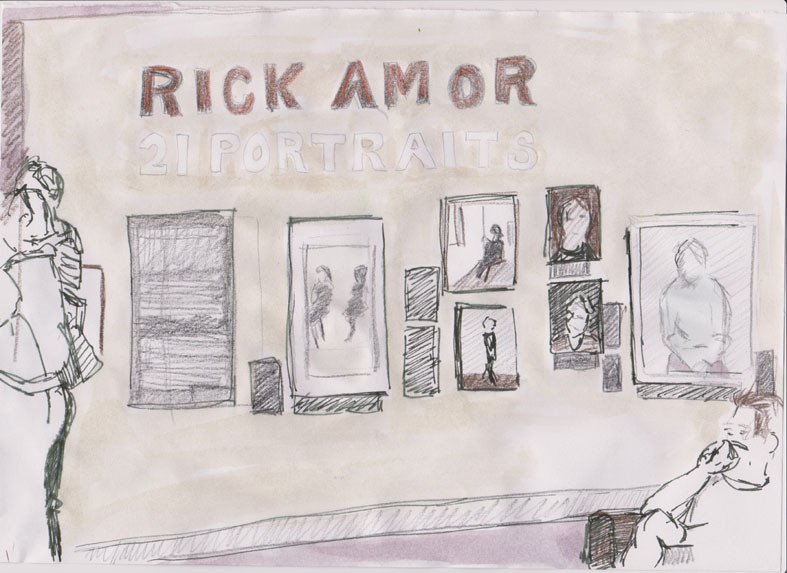 After I’d finished drawing I went over to look more closely at the Rick Amor portraits which vaguely appear in my sketch. 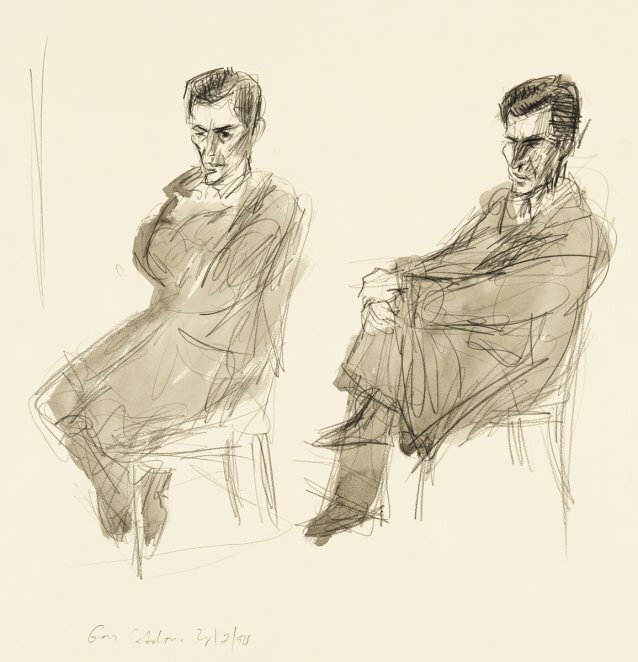 I was particularly interested in the preparatory drawings for Amor’s 1994 portrait of Gary Catalano. 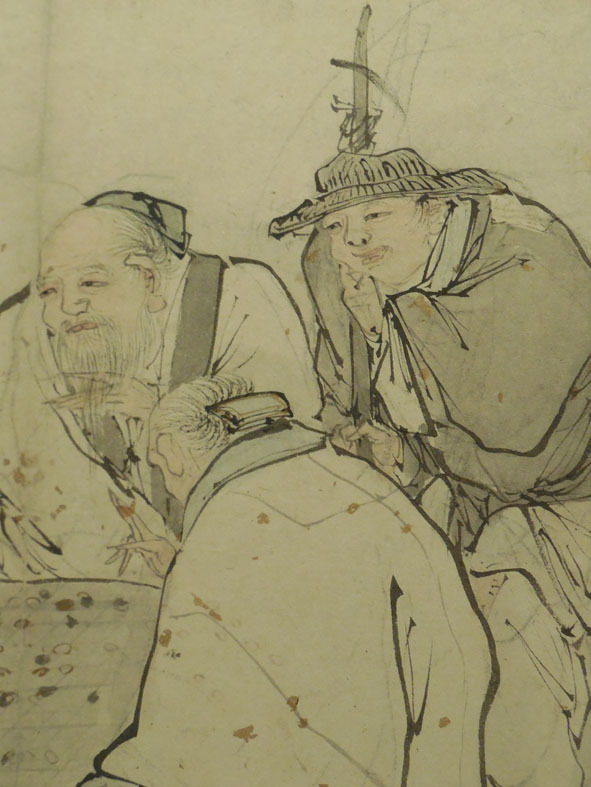 I was impressed by the economy of the drawings with no need for extensive explanatory detail. Gary Catalano, 1994 by Rick Amor, oil on canvas (57.0 x 57.0 cm) , private collection. 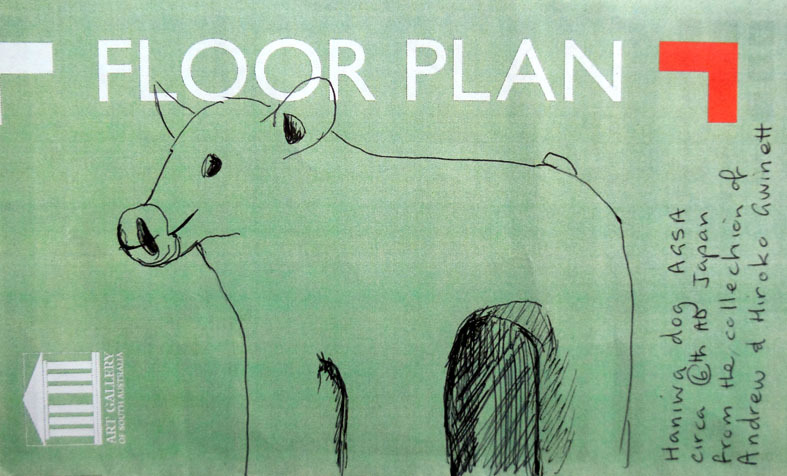 Their adaptation to the final painting doesn’t lose the spareness conveyed by the drawings. There’s quite a lesson in that approach. So I will promise to persist and with persistence I will become an even better artist. Hokusai sensei arigato gosaimashita! (Thank you Teacher Hokusai!). 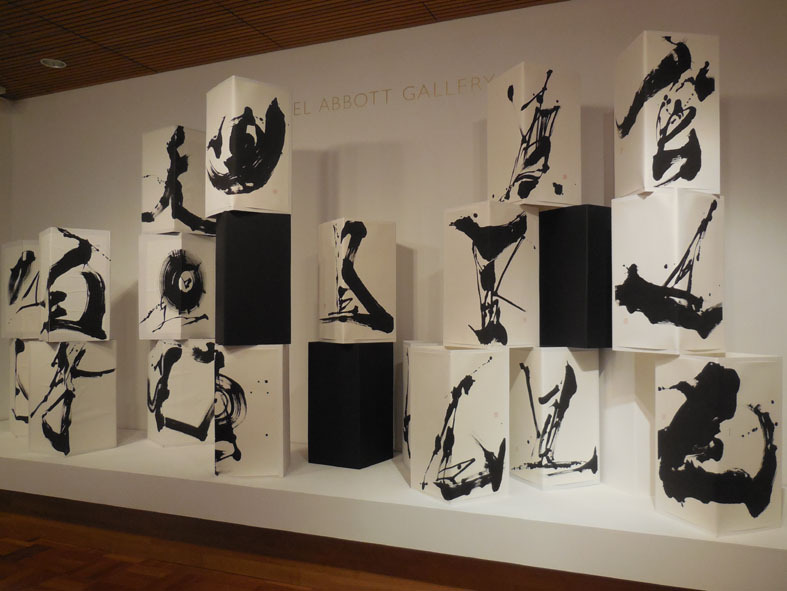 During my brief stay in Adelaide I visited the Art Gallery of South Australia to see a ‘mini’ exhibition of calligraphic works on display in their Asian galleries. 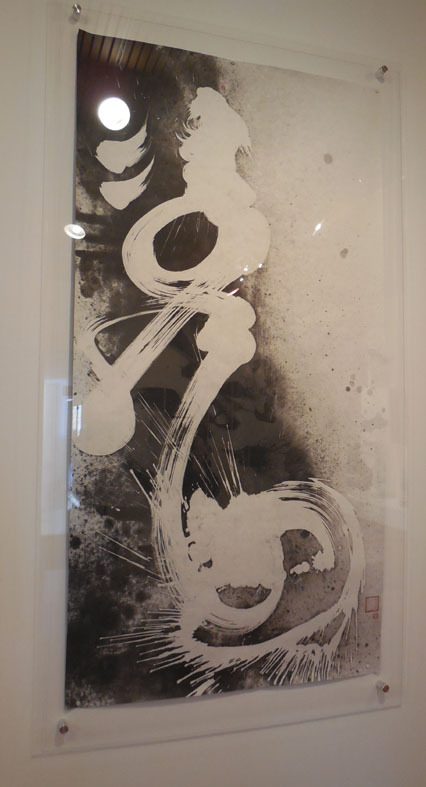 The exhibition, Brush and Ink, Contemporary Asian Calligraphy, displays large scale calligraphic works from China, Japan and Mongolia. Japanese artist and commercial designer, Hiroko Watanabe’s installation takes up the end wall of the room. According to the room notes the 3D nature of this work is reflective of her work making commercial light-boxes to be placed on buildings. I always like to see ‘gesture’ in drawing and this work has it in bucket loads. I gather from the various reviews of this work that it was actually made during a performance with the group Above the Clouds, as part of the OzAsia festival. An interesting review of Watanabe’s performance can be found here. 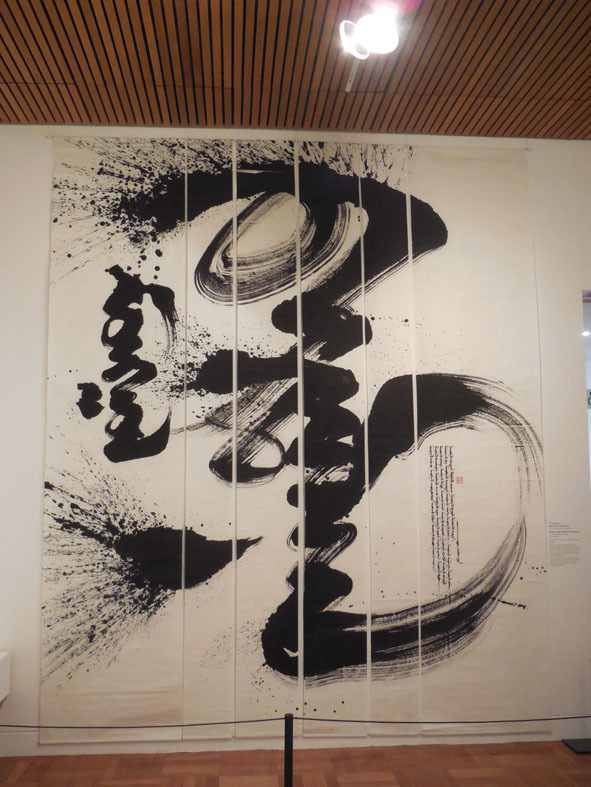 The Mongolian calligrapher’s were a revelation, quite literally I have never seen any of this calligraphy before and I only recently learned that there was a Mongolian script. 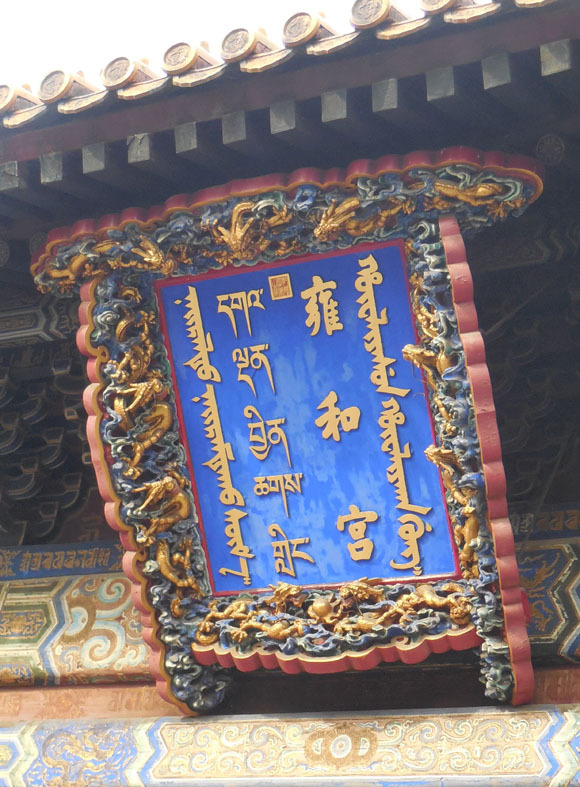 This plaque attached to the Yonghe (Lama) Temple in Beijing is written in 4 distinct scripts from left to right as you see it Mongolian, Tibetan, Chinese and Manchu. Inscription on the Yonghe Temple Beijing in four scripts, (l to r) Mongolian, Tibetan, Chinese and Manchu. The exhibition room notes say that ” calligraphers from Mongolia often describe the physical act of writing from the top down in one fluid motion, ‘as a man riding a very fast horse’, or like a falling coin'”. I can only concur as the overwhelming sense I had of these works was of their dynamic motion. This ceiling to floor work by D Ganbaatar is a case in point. I’m still trying to understand how this work “Aspiration”, by Lkhagva Tuvshinjargal, has been made (apologies for the light reflections in the photo, they were unavoidable). I couldn’t tell if this was white ink on a previously prepared paper or some type of reductive technique, like bleach taking colour out of a dark cloth. If anyone knows how this technique is achieved I’d be interested to find out. If you would like to see more of Lkhagva Tuvshinjargal work I found some on this Hungarian blog (Google translate works well as my Hungarian is non-existent). 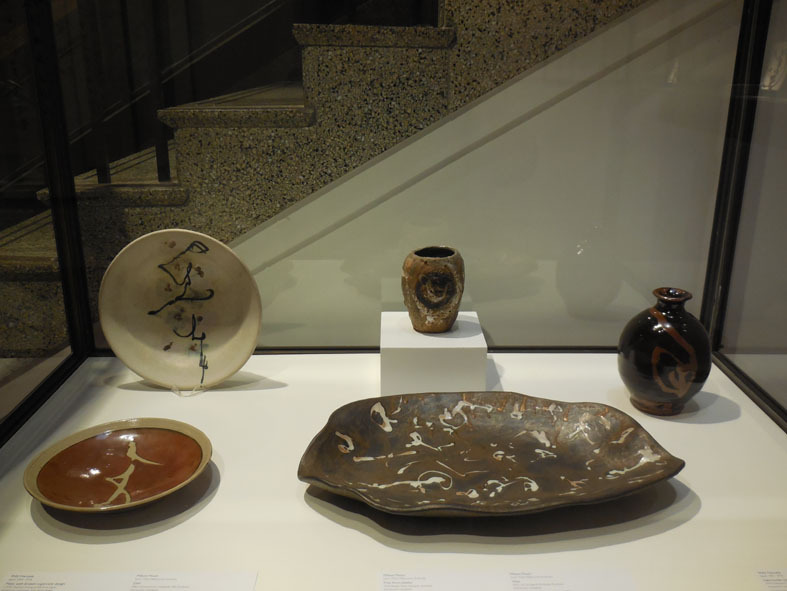 I also enjoyed this small collection of calligraphy on ceramics, from the AGSA’s own collection, also on display as part of the exhibition. 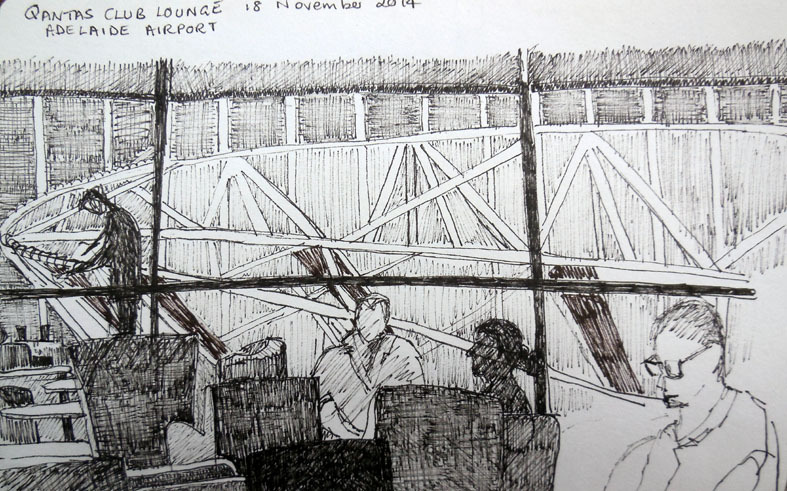 While I’m still in travel mode I’ll share three airport drawings from my recent travels. Sydney Airport food court on our way out of Australia. Waiting at Guilin Airport waiting for our flight to Kunming. Our return flight from Adelaide, in the Qantas Club Lounge, looking out over the airport forecourt. 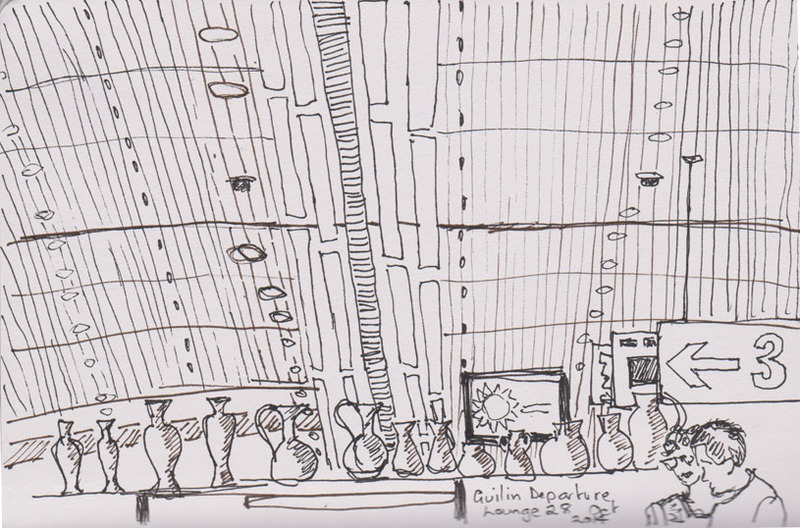 In the Qantas Club Lounge, 18 November 2014, Copic marker and Pit artist pen. Imagine this, you’re in an amazing museum, with floors and floors of things to see and an hour and a half to do it in. What do you do? This was the dilemma I found myself in on several occasions while I was traveling in China. If you are on a group tour you have to accept that, in the words of our tour guide, what you consider ‘a beautiful museum’ is someone else’s ‘another boring museum’. The Shanghai Museum of Art, built in 1996, in what can only be described as grand hotel lobby style (lots of marble), houses countless works of art and national treasures. I soon realised that I could only focus on a small portion of the collection. 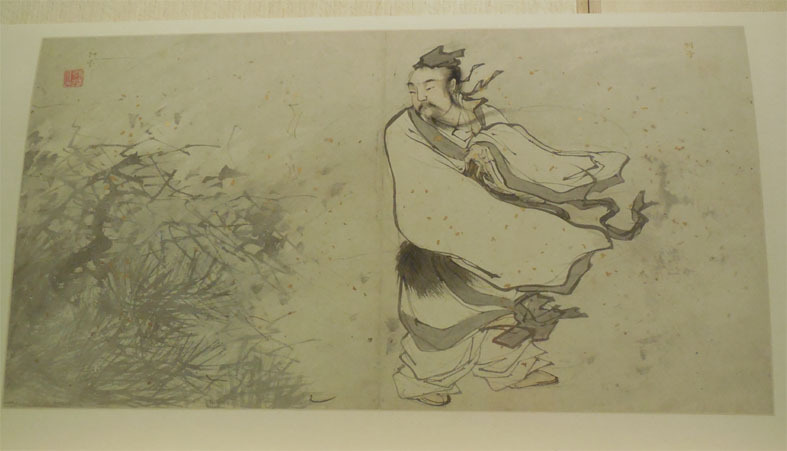 After a brief flirtation with the minority group textiles I wandered down a floor and found the amazing paintings of Zhang Lu, (1464 – 1538), who worked professionally as an artist, independent of the imperial court. I was able to record these amazing works because you can take photographs in the museum as long as you don’t use a flash. 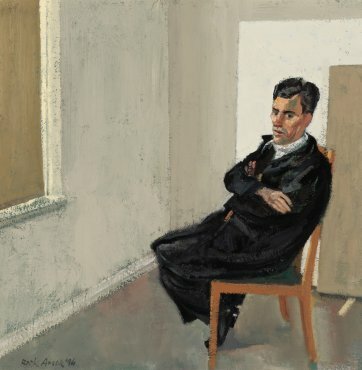 The dynamism of his brush strokes and ability to depict people with great economy really resonated with me. 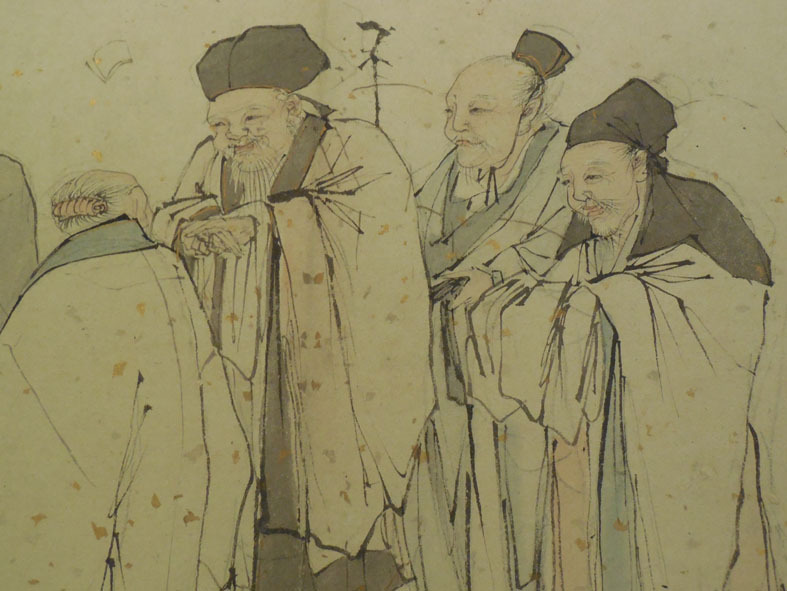 Detail of the painting of the Philosopher Liezi by Zhang Lu. The gold fragments, which may appear to you as spots on the paper, are actually inclusions in the paper. It’s quite a common type of paper to use for calligraphy even today. I will share two other images with you. The Four Sages of Shang Mountain. The Five Elders (also representing the five elements -Wood, Earth, Water, Fire, and Metal). I could live in envy of Zhang Lu’s ability to paint such lively lines, but I know the benefit will come from my trying to develop such facility in my own work. 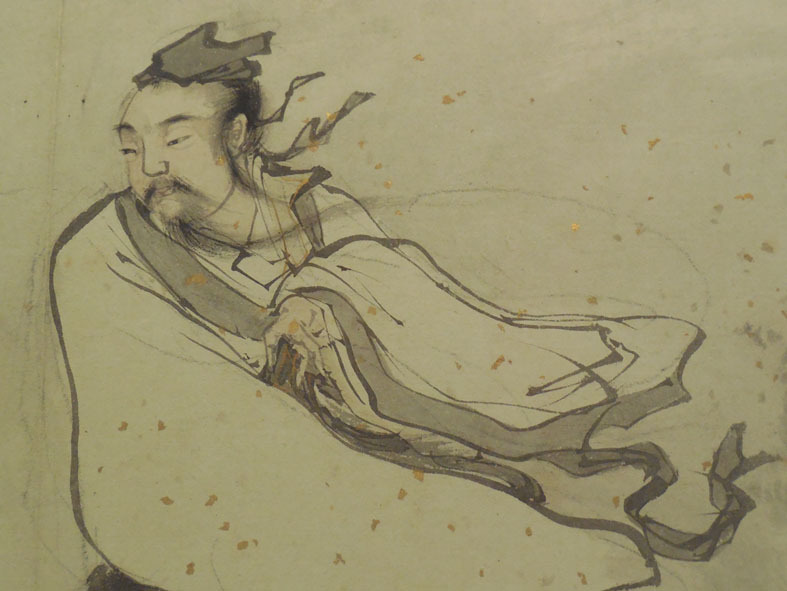 If you would like to see more images of Zhang Lu’s work I would recommend the Los Angeles County Museum of Art, Album of Daoist paintings, which was part of their 2013 Exhibition Ming Masterpieces from the Shanghai Museum. Back in the land of Oz and we had barely been home for two days before we had to hop on a plane again to celebrate a family wedding interstate. I was still in a drawing frame of mind and what caught my eye over those few days were dogs. 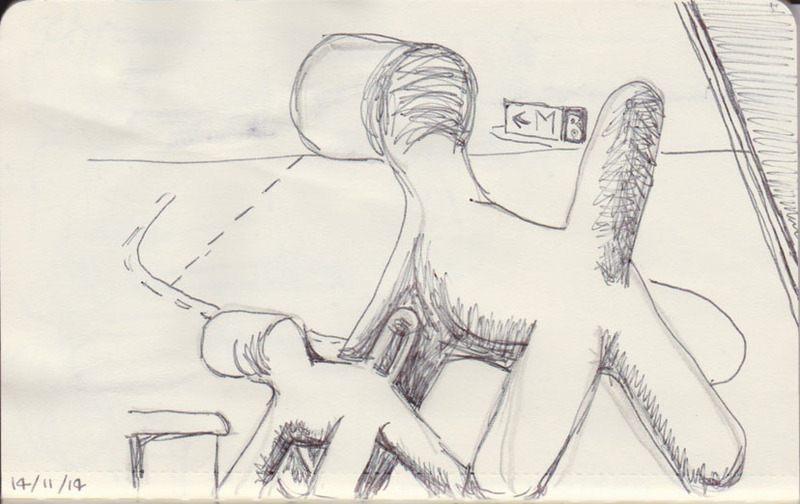 In the airport lounge in Canberra two plastic ‘Puppy’ dogs (designed by Eero Arnio for Magis Me Too), were placed looking out onto the tarmac, waiting for some children to play with them. Two days later we were in the Art Gallery of South Australia and found a Haniwa dog. These terracotta sculptures were made in Japan in the Kofun period (3rd to 6th century AD) and were used as tomb markers. They are fairly abstract shapes and this one looks quite chunky. The face looks rather like that of a pig to me, but I think this is a result of the coil technique used to build the clay figures making more of a snout than a tapered dogs nose. 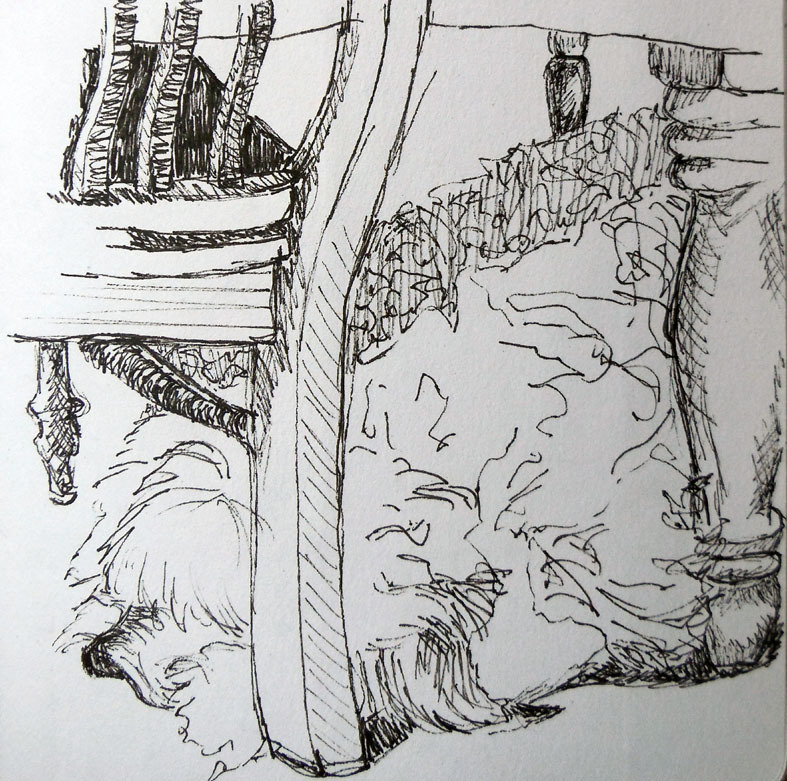 What you can’t see from this sketch is the curled tail that of a Japanese akita dog. Finally I couldn’t leave out Sam, the Old English Sheepdog, who’s house we were staying at. Beijing has been the final stop on our journey. In a few hours we’ll be flying out of China. It’s been an interesting few days here as the city has been hosting a major international meeting of the APEC group. On the down side we haven’t been able to get to some places in the city due to the security lockdowns, but on the plus side we have had 4 days of glorious blue skies and perfect autumn weather. This is thanks to the local government policy of closing nearby factories and running an odds and even system for cars in the city for the duration of the meeting. 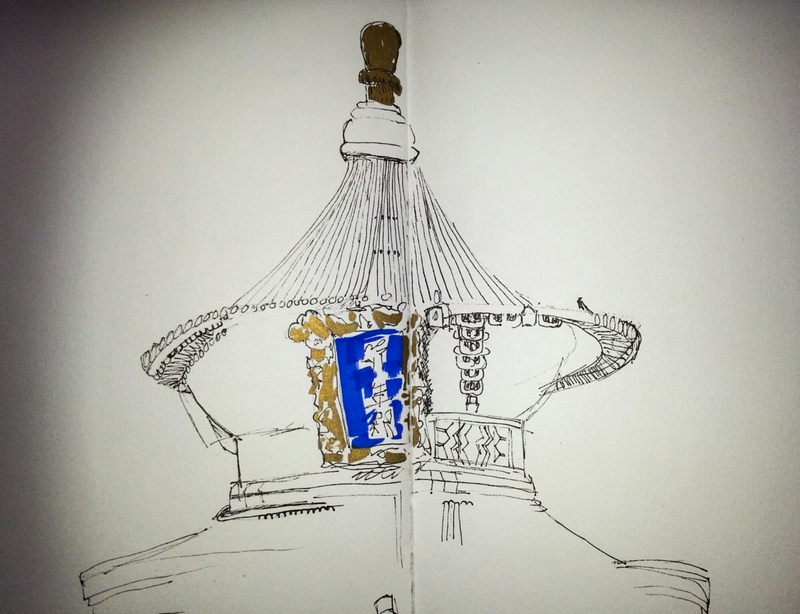 Our tour started with the Temple of Heaven, originally an altar where the emperor prayed for good harvests. 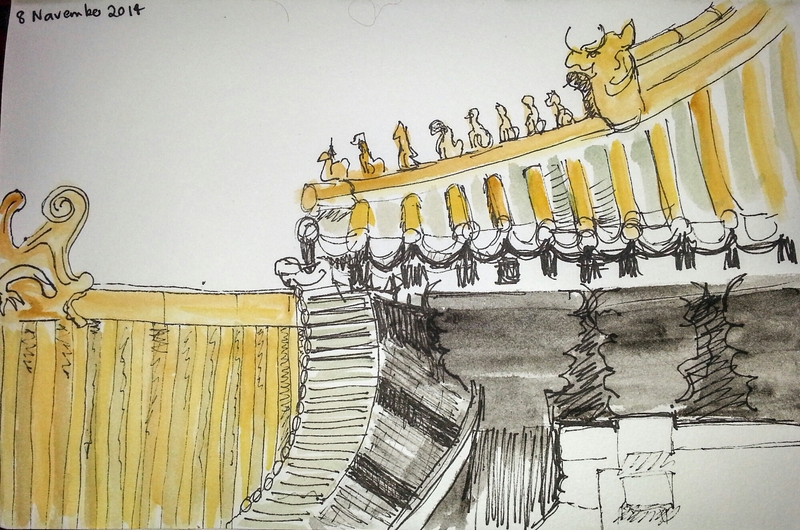 The next day we visited along with the rest of the city, or so it seemed, the Forbidden City. The central axis provides gate after impressive gate and hall after massive hall. All the layout is based on the principles of feng shui. The golden roof tiles are solely used for imperial buildings. These parts of the palace have been heavily restored, which is the approach preferred by the Chinese. However, I quite liked some smaller residential areas where some original furniture and objects could still be seen through the smudgy glass and the paintwork of the buildings at least appeared to be as it was when it was last painted. We had the best weather for our trip to the Great Wall. 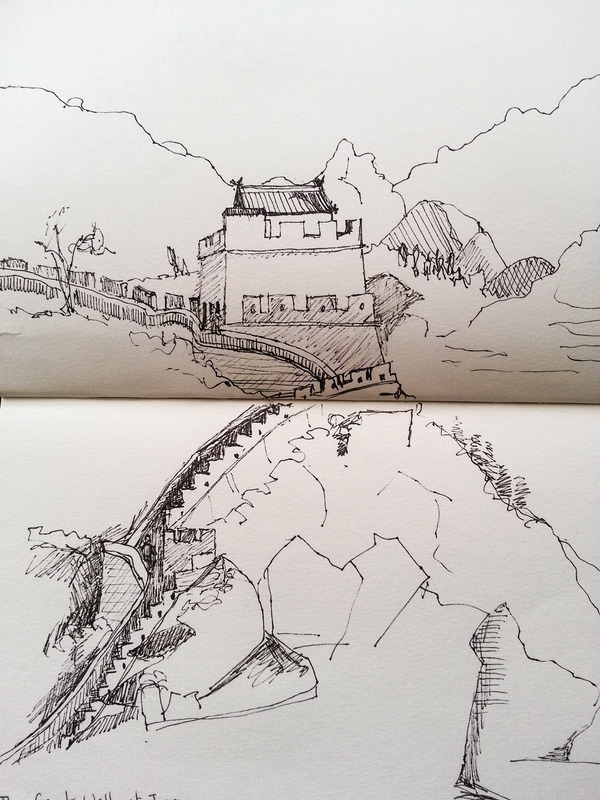 We arrived early and while the hardy types climbed up to the watchtowers I was content to stay at the lower levels and draw. This is what you could see. A seething mass of people scrambling up the uneven steps. This section of the wall at Juyong is more dramatic than the section I had previously visited at Badaling. 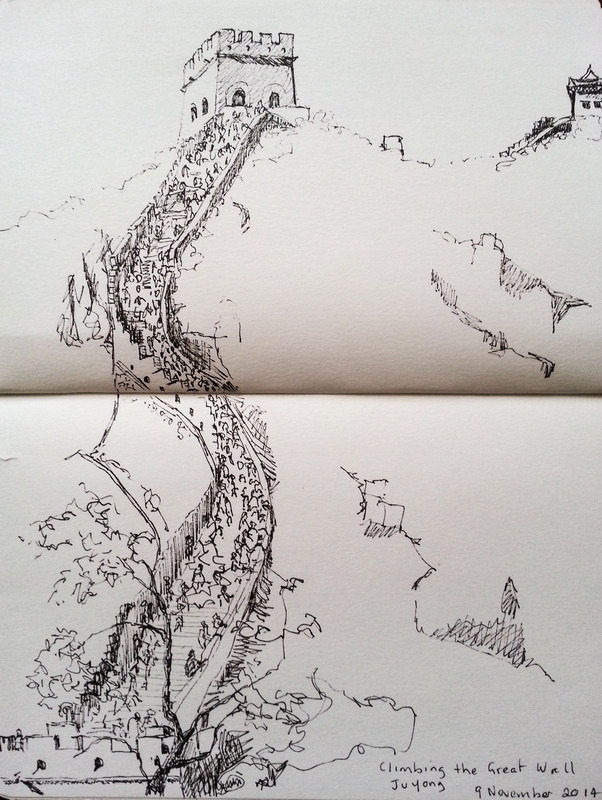 After restorative hot chocolate I had enough time to make a second drawing of a watchtower on the other side of the valley. 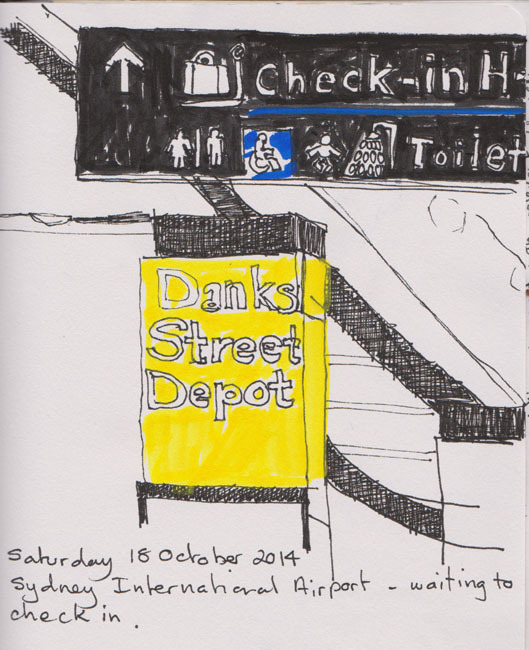 While I visited other interesting parts of the city I will leave my sketch diary here. 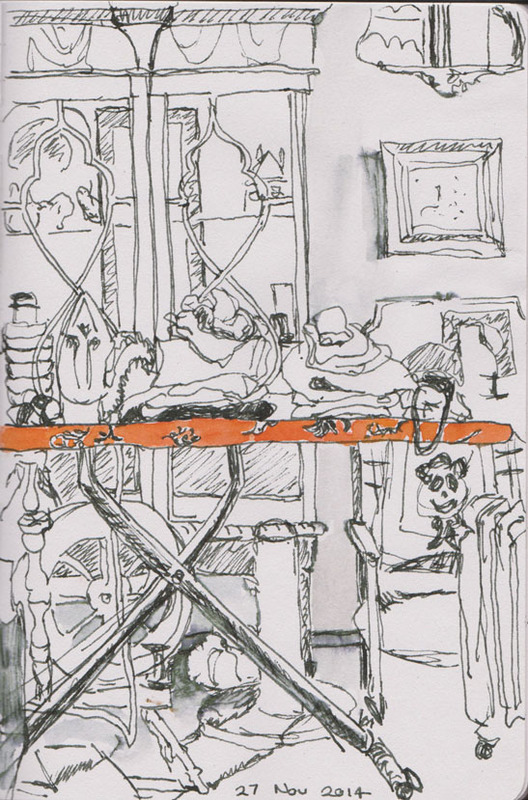 Once I get back home (and tackle the washing) I’ll scan my drawings and set up an album on Flickr. Until then, safe traveling!